Kalidasa said, “Pushpeshu jati, purusheshu Vishnu; narishu Rambha, nagareshu Kanchi”. Of cities, it is Kanchi, he said. It is not a surprise he said that given the wonders that are strewn around this town that is a microcosm of India, its magnificent structures testifying to its glorious past as a melting pot of cultures and faiths. Kanchi was a cosmopolitan city even back then when it was the capital of the Pallavas. It was home to all major faiths - Shaivism, Vaishnavism, Jainism, Buddhism, which blossomed in all their glory. 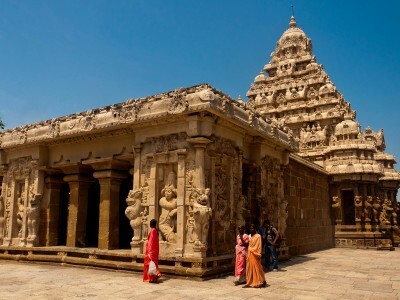 It is a city that witnessed the reign of many majestic kingdoms - the Pallavas, the Cholas, the Vijayanagara empire - that have all left their imprints in time in the form of the matchless pieces of architecture that be its temples. Pallavas ruled a portion of southern India and dominated the Telugu and northern parts of the Tamil region for about 600 years until the end of the 9th century. 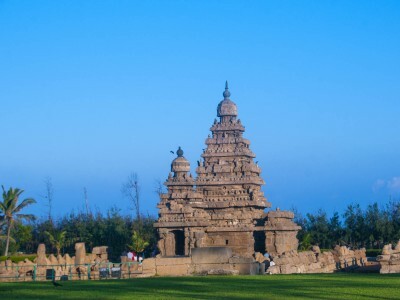 Pallavas are most noted for their patronage of architecture, the finest example being the Shore Temple, a UNESCO World Heritage Site in Mahabalipuram. The Pallavas, who left behind magnificent sculptures and temples, established the foundations of medieval South Indian architecture. This tour is a specially tailored itinerary to give you an immersive understanding of the Pallavas and their temple architecture. This tour will be across Kanchipuram and Mahabalipuram where we can find the finest examples of the architecture from the Pallava period. 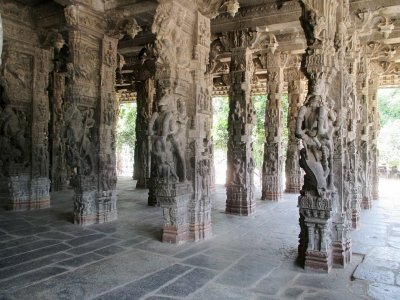 Kanchi is considered as the “City of Thousand Temples”, most of which, be it ancient or new, are living temples. This tour will be led by Dr. Madhusudhanan Kalaichelvan, one of the most well informed and scholarly subject matter experts. 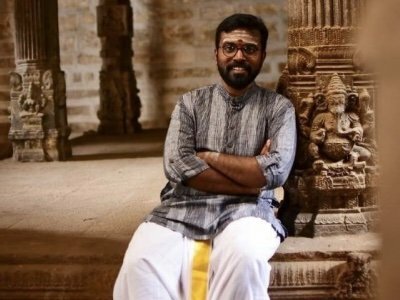 An architect, conservationist, painter, epigraphist, he has been conducting guided heritage tours through Road Access to Temples Heritage And Monuments (RATHAM). We begin the journey late in the evening from Bengaluru. We will meet at the departure point and travel by overnight bus to reach Kanchipuram early in the morning the next day and check-in to the hotel for a brief rest. After an early breakfast, we begin our tour of the temples of Kanchipuram. The highlights of the day will include the Kailasanathar Temple, the Ulagalanda Perumal Temple, a visit to the traditional weavers of the gorgeous Kanjeevaram sarees and the Sankara Mutt. Lunch will be a typical Tamilian lunch at one of the most famous restaurants of Kanchipuram, Saravana Bhavan. 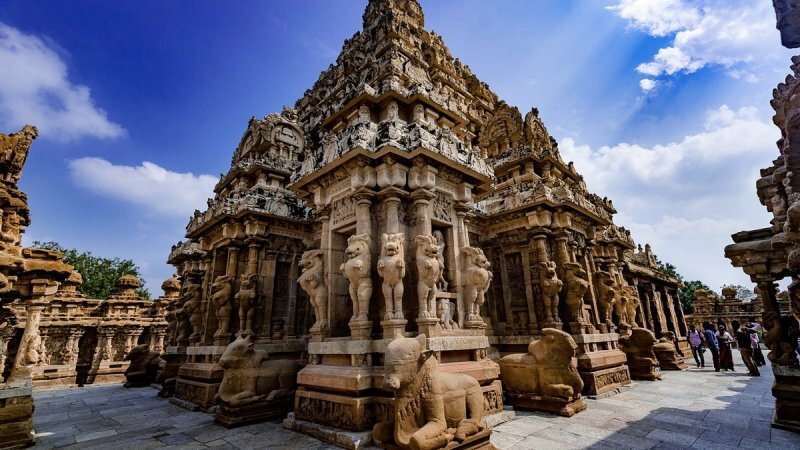 Among the other places we will visit during the day is the Mathangeeswarar Temple, a Naadavaavi (stepped well) on the outskirts of Kanchipuram and the Thiruparuthikundram Digambar Jain Temple. Constructed in the Dravidian style, Ulagalanda Perumal Temple is one of the 108 Divyadesams dedicated to Lord Vishnu, who is worshipped here as Ulagalanda Perumal and his consort Goddess Lakshmi as Amudavalli. The Kailasanathar temple is the oldest temple in Kanchipuram and a magnificent example of the Dravidian architecture style. Kanchipuram is well known for its hand-woven silk sarees. The sarees are woven from pure mulberry silk. 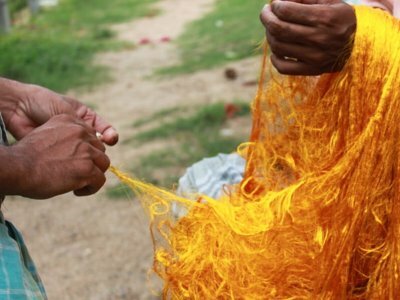 to weave a Kanchipuram sari, three shuttles are used. The weaver works on the right side while his aide works on the left side shuttle. Thousands of families are involved in the saree production. We will visit the traditional weavers to understand the process of weaving a gorgeous Kanjeevaram saree. These sarees are worn as bridal & special occasion sarees by most women in Tamil Nadu, Karnataka & Andhra Pradesh. It has been recognized as a Geographical indication by the Government of India. At the end of the day, we will then return to the hotel for dinner. 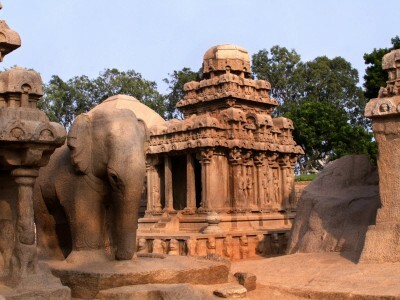 After an early breakfast, we travel east to the coastal resort town of Mahabalipuram or Mamallapuram to see the group of monuments at Mahabalipuram, which are a UNESCO World Heritage site. 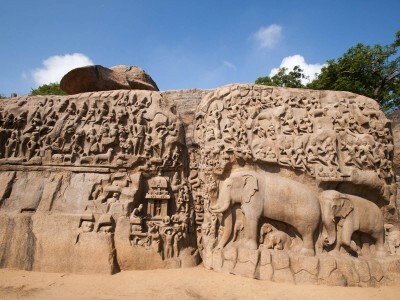 The highlights of the day in Mahabalipuram are the Pancha Rathas, the Arjuna’s Penance panel and of course the magnificent Shore Temple. We will in between have lunch in Mahabalipuram itself. The Pancha Rathas, is a monument complex containing five monuments each of which resembles a Ratha (chariot). Arjuna’s Penance is one of the largest rock reliefs in the world and carved on monolithic rock boulders. The Shore Temple is one of the oldest and most magnificent structural stone temples of South India. After Mahabalipuram, we will drive back to Kanchipuram where we will visit the Ekambaranathar Temple, one of the largest temples in India. This temple is one of the Pancha Bhoota Sthalas and associated with the element of earth of the five elements. The Shiva lingam here is referred to as the Prithvi lingam. We will then return to the hotel for dinner. After an early breakfast, we will checkout of the hotel. The highlights of the day will be the Kanchi Kamakshi Ambal Temple, the Vaikunta Perumal Temple and the Varadharaja Peruma Temple. 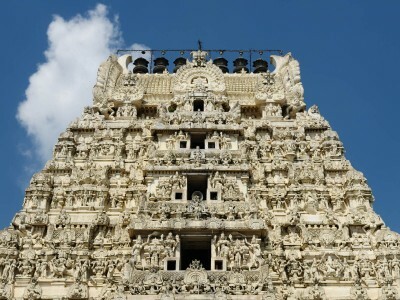 The Kanchi Kamakshi Ambal Temple in Kanchipuram is one of the Sapta Puris, seven holy pilgrimage centres in India. The Vaikunta Perumal Temple and the Varadharaja Perumal Temple are aboth among the 108 Divyadesams dedicated to Lord Vishnu. 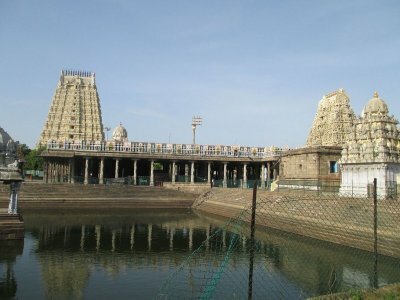 The Vaikunta Perumal Temple is considered to the second oldest in Kanchipuram after the Kailasanathar temple. One of the greatest Hindu scholars of Vaishnava VisishtAdvaita philosophy, Sri Ramanujacharya is believed to have resided at the Varadharaja Perumal Temple and is one of the most sacred places for Vaishnavites. We will then have lunch along with a comfort break at one of the Saravana Bhavans and then start our return journey to Bengaluru. After a short break along the way, we will return to Bengaluru late in the evening. 1. The tour will involve enough walking outdoors in the day. Please ensure you carry your caps and sunglasses. Keep a bottle of water ready with you always to beat the heat. 2. Given the walking we will be doing, ensure you get a good pair of walking shoes that you’re comfortable with, for the tour. 3. If you need things like medication, keep it handy and ensure you bring it along with yourselves. Do not depend on being able to buy such locally. 4. If you have any allergies, be sure to check explicitly on the food that will be served to you. 5. Please ensure you have enough cash for miscellaneous expenses you may incur. Do not depend on ATMs etc. locally to provide for this. 6. The tour will start early morning and we will return late in the evening the last day at the departure point. So, if you’re not from the city where the tour departs from, it is best if you plan your arrival and departure one day on either side of the tour departure date at the least.